Home > Bakar > Politics > Thoughts > Delhi Assembly - Did BJP Err in Judgement? Delhi Assembly - Did BJP Err in Judgement? It has been quite some time I have been thinking about this and finally thought of writing out my views. Recent video release by AAP has simply brought this issue to the forefront of politics and every person has his or her views. 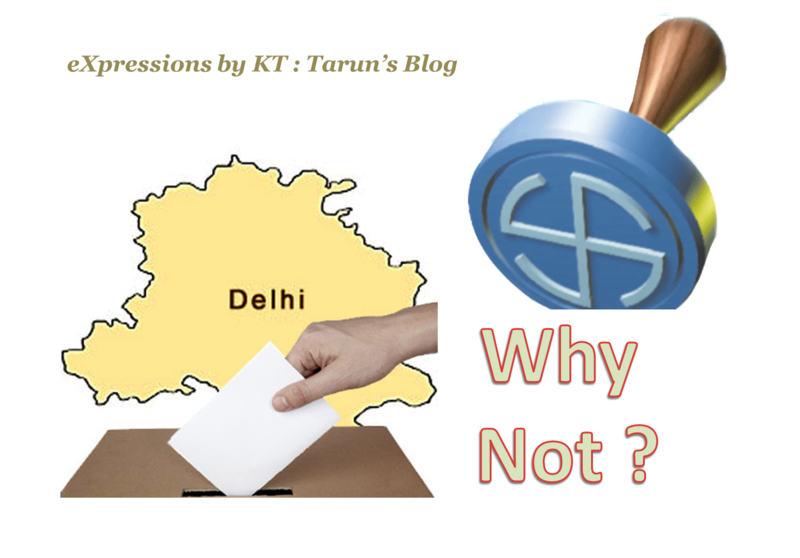 What my line of thought is regarding the reasons why BJP would not opt for elections in Delhi. In the immediate time-frame post victory at center, AAP and Congress both were not a major force, atleast for the time being, with both these parties figuring out internally how to take the results. I feel the victory wave alone could have taken them through. BJP already had a manifesto with which they became the largest party in 2013 assembly elections and hence they did not need many preparations in terms of logistics. Electorate still blamed AAP for their resignation and it was the right time to exploit the shambles that most of the opposition was in at that time. As I began to research through the politics behind this decision of not initiating elections, I ventured to my friends and social networks. Here is what came through from these discussions - three key reasons behind the decision by BJP. These obviously are some reasons which we as common people could think of and I am sure the collective political wisdom within BJP, which would be much higher than we mortals here, would have devised their own strategy. This apparently seems to be the biggest reason why BJP could not have risked going to elections post the victory in General Elections. Many leaders from state including Harshvardhan Singh and Meenakshi Lekhi were elected to the Parliament and hence there was a lack of face at state level. BJP could not have risked allowing those newly elected MPs back to state politics as this would have compromised their margin of majority in Lok Sabha. Further, an election announcement at state could have ignited infighting for the top post in Delhi unit of BJP which would have stolen the thunder from BJPs thumping victory. BJP for sure had leveraged most of their funding sources to accommodate the media and advertisement blitz in the General Elections. Now going back to the same sources so soon for additional funding would not have borne fruit. Now no elections in India can be fought without money power – whether used legally or illegally. Hence money could be one of the reasons behind this decision. One reason could be that the BJP strategists had too much confidence in the ability of the Modi Sarkar and may have hoped that the government at center would simply change the face of Delhi in a couple of months which was anyway improbable possibility. It takes time for any government to settle down and bringing observable impact has a long gestation period. It also did not help that immediate post winning in center, Delhi had to face worst power woes. If this was the reason for the delay in elections, it simply backfired. I think this is one political mistake that BJP would probably repent in days to come. In my opinion they should have gone for elections in Delhi as soon as they could have post getting into power at center. They had a popular perception behind them and were riding on a "Modi Wave". The delay has only created problems as the government which came with huge hopes obviously could not achieve much in this short duration anyway but it still creates slight disappointment in public. Now, this led them to attempt forming a government by bypassing elections which has only aggravated their woes. BJP functionaries like Sher Singh Dagar being caught on camera in their overenthusiasm to gain importance within party did not obviously help. The entire episode has simply fueled a slight distrust among the masses. So, in short, probably a mistake in shortsightedness of glory is the reason that Delhi has become an "Albatross around the neck" for BJP. Do you have more reasons to add to this list or have objections to one of them? Do you think it was a right decision to delay elections in Delhi? Or you simply think this is a biased opinion making no sense? What does this post make me – an AAPTard or Bhakt? Appreciate or criticize in comments below.